Cross-posted from my blog. Promoted by Rosi. Former GOP Assemblyman (LD16) and 2017 Gubernatorial Candidate, Jack Ciattarelli, closed his recent op-ed in the Star Ledger with this: New Jersey can be fixed. But first we need some truth-telling. I agree…. Today I joined a group of Hawthorne parents and the NJ Working Families Alliance for a press conference at our Borough Hall. We came out because Hawthorne is one of the 40 “Dollar Districts” that Governor Christie claims are getting a bump in state aid this year when he is in fact giving them a single dollar increase. If you’re like me, you’ve been inundated with campaign commercials from the governor touting this year’s budget as the “most education funding ever.” That’s about as ridiculous as claiming that one additional dollar is an increase. 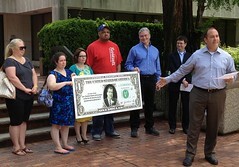 To commemorate Christie’s chutzpah, we brought a giant one dollar bill with the governor’s face on it. Christie can claim to be a friend to public education in his campaign commercials and in his town halls, but New Jersey parents have his number. Literally. The truth is that this governor has a terrible record on public education, and every parent and property tax payer has suffered the consequences. Hawthorne, like every other municipality in New Jersey, was cut to the bone in 2010 and has been underfunded every year since. In fact, it’s getting only half of the aid it’s entitled to under the law. Each school district dealt with their cuts a different way. Some districts laid off teachers and staff, others imposed heavy fees, and almost all raised property taxes. Parents at the event talked about the impact of the cuts on their child’s education, whether it was larger class sizes or a loss of special education support. Others spoke about property tax increases. Let’s face it: school aid is essentially direct property tax relief for middle-class families. And it’s no surprise that between Christie’s cuts to school aid and the Homestead Rebate program the property tax burden for middle-class families is up 20%. The worst part of Christie’s continued underfunding of education is that it’s so unnecessary. The money is there. For the last three years Governor Christie has underfunded our schools while giving tax breaks to the richest 1% and the state’s most profitable corporations. If Prudential, Panasonic and Pearson Education can get their new office towers bankrolled by the state, why can’t Hawthorne get the $1.8 million it’s entitled to under the law? In less than a month the legislature is going to pass a budget. They can choose to either accept Christie’s numbers or they can fight for a meaningful increase in aid for Hawthorne and every other district in the state. Here’s hoping they make the right choice. Chris Christie won the Governor election with less than 50% of the vote. That means more than half of the voters wanted someone other than him to govern. He has consistently abused his power. He pulled rank as a US Attorney to get out of a ticket when he went the wrong way down a one way street, and also pulled rank when he got a speeding ticket in an unregistered car to avoid being towed. He failed to disclose his close financial relationship with top assistant Michele Brown, a conflict of interest. He gave huge no bid contracts to his boss (John Ashcroft) and the man who didn’t prosecute his brother for securities fraud, while 19 others were prosecuted. He governs with a personal vendetta to the detriment of New Jerseyans. They didn’t mobilize over health care reform. They didn’t mobilize against the wars in Iraq or Afghanistan. They didn’t mobilize about a xenophobic law in Arizona. They mobilized against a 1.5 percent salary contribution toward health care. Such is the progression of democracy in America. Smacking the latest volley between the two, in what been a nearly daily affair for months, Christie said union president Barbara Keshishian was “no slave to the truth” herself. Keshishian, in an op-ed in The Star-Ledger on Sunday, called the governor a liar for his characterizations of recent issues, including student walk-outs, pay freezes and even homework. To throw another log on the fire, the impact of Christie’s decision not to reappoint Justice Wallace to the Supreme Court cannot be underestimated when we are talking about this fight. The pension plan that was passed is being appealed to the court. More legislation will come that will likely be challenged. And that says nothing about the coming proposals for school funding changes which will certainly be challenged in the courts. Data on public higher education that Republican gubernatorial nominee Chris Christie provided during an appearance in Westfield last week has proved inaccurate. During a press conference following a round table discussion on higher education issues, Christie cited an anecdote from a New Jersey guidance counselor saying that a New Jersey student attending either of two campuses of the State University of New York – Albany and Binghamton – would pay less money than attending Rutgers. Christie used the anecdote to reinforce a statement he made during the roundtable saying that New Jersey’s public colleges have become too expensive for New Jersey students. Last week Christie toured the state with running mate Kim Guadagni holding a series of events on higher education. A review of data for projected 2009-2010 costs at the three universities in question by Westfield Patch reveals that Rutgers would be cheaper for a New Jersey resident to attend, and live on campus, than either of the two SUNY schools referenced by Christie. A New Jersey resident living on campus at Rutgers is expected to pay $22,262 in tuition and fees for the 2009 – 2010 academic year. An out-of-state student at the University at Albany will be paying $24,886 in projected costs for next year. An out-of-state student at Binghamton University will be paying $27,280 in projected costs for next year. SUNY schools traditionally refer to themselves without using the SUNY moniker. A Christie campaign spokeswoman said that the gubernatorial candidate had been using the story in order to emphasize his point on higher education. She said he had trusted the person who told him the information and started using it. The spokeswoman said that Westfield Patch’s inquiries into the issue would cause the former U.S. Attorney to stop using the anecdote at future campaign stops. “Chris was using a story he was told to prove a point about the affordability of New Jersey schools,” Christie spokeswoman Maria Comella said, noting that while the candidate will stop using the anecdote he will continue pressing for lowering higher education costs. He started to use a story without ever checking on whether it was true? I have a few tall tales I’d be willling to share with the GOP nominee for Governor if that’s the way he does things. I’m sure there are a few people who Christie touts as his accomplishments who tried the same excuse. So in the same event, their Lieutenant Governor candidate didn’t tell the whole story on why her son wouldn’t go to school in NJ and Chris Christie used facts that were completely wrong. And that’s on top of the fact that they say they’d turn down stimulus funds with “strings”, but in the same breath say they’d accept education funding that has the same requirements. It’s just another day on the campaign trail for the Christie campaign apparently. Great work by the Westfield Patch to catch this one.